Oh ... almost forgot his keyboard player, Johnnie Johnson. The greatest. He actually hired Chuck to play in his band way back in the 50s when his guitar player got sick and never returned. Chuck had limited experience playing guitar back then but his voice and personality and writing ability immediately made him a force to be reckoned with. He wrote Maybelline and the Chess Brothers signed him as a solo act. Apparently, he took over the band soon afterward because ... as Johnnie said, "We could get better jobs with Chuck running the band. He had a car and rubber wheels beat rubber heels any day." 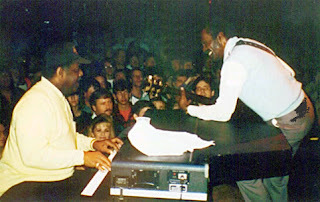 Chuck wrote Johnnie B. Goode as a tribute to Johnson referring to Johnnie's behavior when he was drinking. Chuck was a tough leader and insisted the band not drink in the car on the way to jobs. The band complied by sticking their heads out of the window when they were drinking. 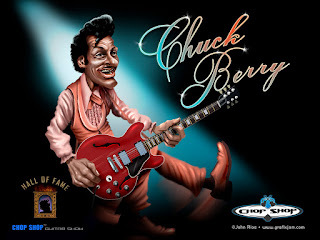 I remember seeing Chuck in concert in the early eighties in St. Pete at the groundbreaking of Tropicana Dome. Started out with that famous lick on his guitar ... and then ... he stopped dead in his tracks, staring at someone in the crowd. "If you take your camera out one more time while I'm playing, I'll leave and never come back."